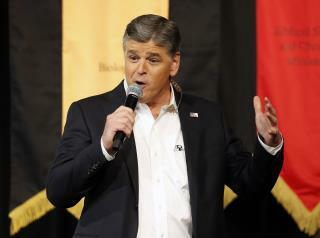 (Newser) – People are still scratching their heads about what role Roger Ailes might be playing in Donald Trump's campaign, but there's a new player in town: Sean Hannity. Writing for the New York Times, Jim Rutenberg says the Fox News host constantly gives the GOP nominee free PR by "[blaring] Mr. Trump's message relentlessly," and taking a "hyperpoliticized" approach to reporting the news. But Rutenberg says sources—or, as he calls them, "denizens of the hall of mirrors that is Trump World"—have told him Hannity has also been a candidate whisperer, serving as an adviser to Trump for months. And it's not something Hannity completely denies, telling the reporter, "Do I talk to my friend who I've known for years and speak my mind? I can't not speak my mind." Hannity adds that his blatant pro-Trump leanings make him "more honest" than other reporters. Hannity is an important counterpoint to the increasingly one-sided liberal media. He exposed Khan(senior)for his flip-flop on Shar'ia law (something the liberal media wouldn't touch). His insight is substantial, and valuable for anyone who wants both sides of the story, and oftentimes, the most critical side. Americans should be skeptical of increasingly liberal, large broadcast corporations (ABC, CBS, NBC, CNN and the like) which, no doubt, receive the lion's share of campaign money, and therefore wish to perpetuate the "establishment" status quo. Trump points out their advocacy and dishonesty, and Hannity backs it up. You have to have a mind to speak it. I find it shocking how anyone can stand this clown for more than 15 seconds. Hannity says, "I never claimed to be a journalist,". Not to worry Hannity, we have a hard time believing you are ever human.